They’re considered something in between asteroids and comets, but still, they’re called minor planets; they also bear the name of the fabled man-horse creatures in Greek mythology – centaurs. Now, scientists have found that a Centaur in our solar system, Chiron, might have rings similar to Saturn’s. Chiron may have rings around it. Credit: ESO/L. Calçada/Nick Risinger. MIT lecturer Amanda Bosh and her colleagues believe that Chiron, the first centaur ever discovered (1977), might also have a ring system. This comes as quite a surprise, because there are only five known bodies with rings in our solar system, and most are gas giants (Saturn, Jupiter, Neptune and Uranus). Chiron is also located in one of the areas in our solar system considered less interesting – beyond Jupiter, in what seems to be a frozen and inactive spatial wasteland. “It’s interesting, because Chiron is a centaur — part of that middle section of the solar system, between Jupiter and Pluto, where we originally weren’t thinking things would be active, but it’s turning out things are quite active,” said Amanda Bosh, an MIT astronomer and a coauthor of a study published Monday in the journal Icarus. Discovered in 1977 by Charles T. Kowal (though precovery images have been found as far back as 1895), 2060 Chiron is part of a distinct class of objects now known as centaurs – minor planets orbiting between the asteroid belt and the Kuiper belt, the region of the Solar System beyond the planets, extending from the orbit of Neptune. The minor planet only measures 125 miles wide; it’s so small that it was initially classified as an asteroid – so it seems quite surprising that a body so small actually has rings around it. This likely has a lot to do with their formation; astronomers believe they form farther out in the solar system, and start to near the sun, slowly warming and ultimately spewing ash and ice into space. While most centaurs are thought to be inactive, astronomers have observed some glimmers of activity from Chiron – enough to make them curious and want to know more. Using two giant telescopes in Hawaii, MIT researchers made observations in the hope of finding more about Chiron, and they were partly successful. But they took their chance, and noticed something interesting. When you want to study a celestial body, like a Centaur, you wait for it to pass in front of a star, something that’s called occultation. As it passes in front of it, you’ll see a dimming in the light coming from the star, as part of the light is blocked by the Centaur. In the case of a simple body, with no surrounding material, you’d see a straightforward pattern – but that’s not what they observed; they observed symmetrical, sharp features near the start and end of the stellar occultation—a sign that material such as dust might be blocking a fraction of the starlight. 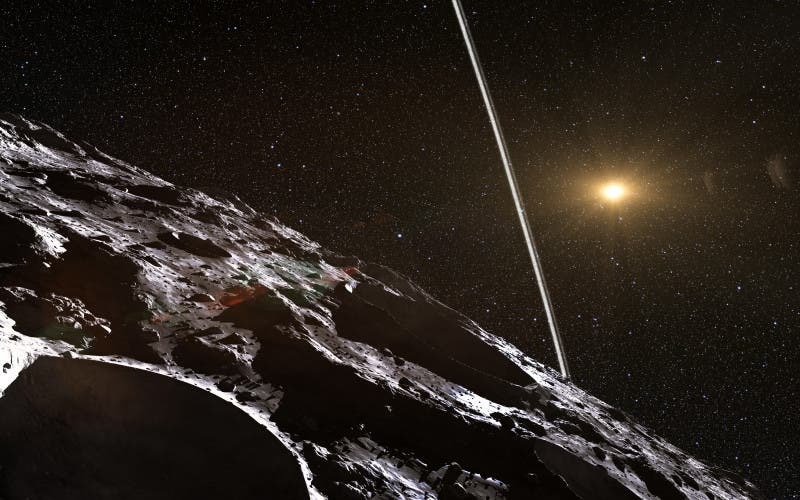 The results clearly indicate that Chiron might have rings around it, but this type of study still needs confirmation from additional observations. 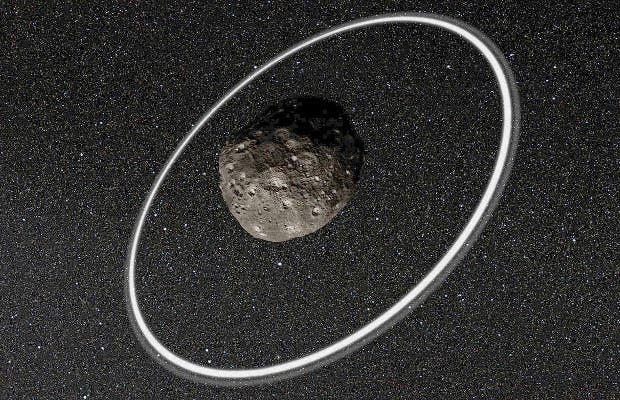 Chiron is not unique in being a minor planet with rings: on March 26, 2014, astronomers announced the discovery of two rings in 10199 Chariklo, the largest confirmed Centaur. Ironically, in Greek mythology, Chiron was the largest, wisest and most powerful centaur. Journal Reference: Jessica D. Ruprecht et al. 29 November 2011 stellar occultation by 2060 Chiron: Symmetric jet-like features. doi:10.1016/j.icarus.2015.01.015.